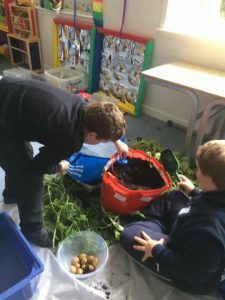 P7 pupils took up their indoor grown potatoes this week. 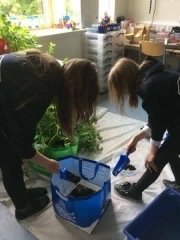 The crop could have been better but Morag their teacher told us next time that she will listen to our advice and plant them outside rather indoors. Don’t always believe the Internet! The kids were delighted, they think they are farmers, they know that tatties grow in the ground and don’t come from trees. The younger kids will dig up the outdoor tatties in August. Morag also let us know about another big bit of learning today. When it came time to cook the tatties we couldn’t believe that not one P7 child knew that we usually boil them in water! They absolutely loved them, though, with butter and grated cheese – said they were the best they’d ever had! !